In fashion, gone are the days when bold colours were the uncharted territory of womenswear. Over the past couple of years we have seen an ever-increasing number of designers stepping away from the trusted, classic tones of black, navy and grey – instead sending models down the runway decked out in wide variety of playful and vibrant hues. Yet it should be noted that not all colours are created equal. Whilst some provide great aesthetic value on the runway, this often doesn’t translate to real life scenarios. For the everyday male, the practicality and wearability of colours such as coral, pink or even yellow (all featured within AW13 collection previews) undermines their potential of cementing a place within your wardrobe, especially during the typically dark and dreary autumn/winter months. Every year, Pantone, an X-Rite company and global authority on colour and professional colour standards for the design industry, singles out a specific shade as their ‘Colour Of The Year’. It is picked after a painstaking and rigorous selection process in which colour usages in every visually oriented industry – from film and entertainment to design, fashion and tourism – are taken into consideration. Indeed, a quick browse through the autumn/winter 2013 menswear previews helps validate Pantone’s choice. 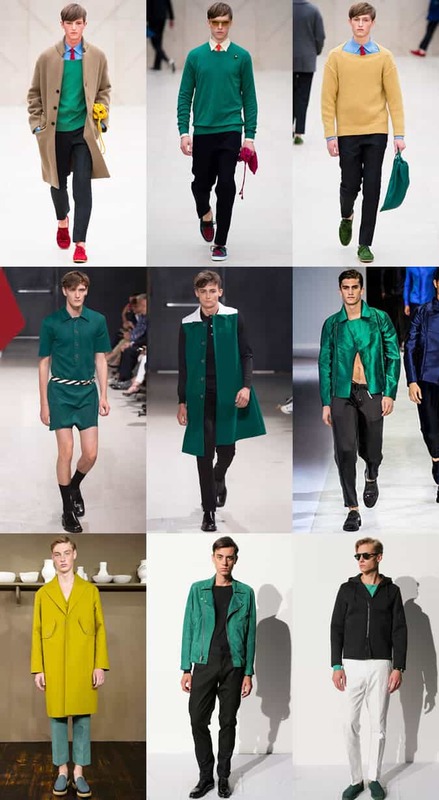 Emerald green made its presence felt in ready-to-wear and accessory collections on runways from London to Paris and Milan. The truth is that emerald – or any bright colour for that matter – is not exactly easy to wear. It takes confidence and being comfortable in one’s own skin to pull off with aplomb. However, if you have always been colour-averse, now is the time to jump on the bandwagon and give your wardrobe the injection of life it deserves. Of all the myriad of colour options currently available on the market, emerald is a good place to start due to its versatility and subtle nature. Whichever way you decide to integrate emerald into your outfit, the key to avoid looking like a walking traffic light is to keep the rest of the look natural and simple. To drive the point home, I have produced three easy to wear outfits, which utilise a pair of emerald trousers (another key AW13 trend), for a variety of seasons. The Breton stripe t-shirt is the epitome of Parisian chic and a timeless wardrobe staple. Here we combine it with a pair of Ralph Lauren suede loafers, the height of American prep, to form the basis of a look that takes influence from both sides of the Atlantic. Team the two items with a modern, slim-fit pair of emerald trousers to create an aesthetic that is classic yet contemporary, not to mention summer-appropriate. Whether you choose to go sockless and reveal a little bit of ankle is your call. Although a Breton stripe tee lends visual appeal to the ensemble, your plain white, grey, black or even navy crew necks would work just as well. This just goes to show that a pair of emerald trousers are a fully fledged statement piece, and capable of elevating the whole outfit on their own. With this in mind, there is no need to go overboard or make things complicated – strip the look back and let the trousers take centre stage. Outfit Credits: Closed Dark Emerald Wool Pants, H.E by Mango T-shirt and Ralph Lauren Dark Brown Suede Hysen Loafers. With autumn fast approaching and the thermometer dropping, it’s time to put your lightweight knitwear to work. Over the coming weeks, the majority of men will begin to make the transition from the colourful and fun hues of spring/summer to the darker and more sobering palette of winter. But you don’t have to succumb to the norm – emerald exudes a warmness that renders it appropriate for the season. Pair your emerald trousers with a simple button-down shirt and layer with staples such as neutral cardigans or sweaters. Finish with your choice of footwear – I personally have a penchant for loafers but suede brogues, double-monks or even boots could work just as well. By the same token, you can still get a lot of mileage out of your emerald piece when winter is over and we move into spring, thanks to its refreshing and revitalising appearance. Look no further than the aforementioned SS14 runway shows for concrete evidence. Designers Christopher Bailey and Raf Simons, to name just a few, have stamped their seal of approval. Outfit Credits: Club Monaco Checked Shirt, GAP Merino Cardigan, Closed Dark Emerald Wool Pants and Christian Dior Black Suede Loafers. The versatility of emerald green lies in its ability to coordinate well with many other colours. We can either err on the side of caution and wear it with black/white (as shown in outfit two), or we can take styling cues from Paul Smith’s AW13 collection and spice it up a bit. In this ensemble, I opted for a brown overcoat and brown brogues to create a look that would help us stand out from the sea of head-to-toe black often encountered in places like Paris or New York, come wintertime. Alternatively, if you are looking to purchase a jacket or overcoat in emerald for the colder months, try paring it with black jeans or Earth tone corduroys to help anchor the statement piece and create a clean and contemporary outfit. Outfit Credits: AllSaints Brown Gable Coat, Uniqlo White Shirt, Closed Dark Emerald Wool Pants and Paul Smith Taupe Dip Dyed Suede Miller Brogues. As you can see, with the Pantone 2013 Colour Of The Year title, emerald is having a moment. However, it should not be viewed as just a seasonal colour that comes and goes with time. Its inherent versatility and practical nature will ensure it slips seamlessly into your current wardrobe, making it a worthwhile investment for those who want to begin experimenting with colour in order to take their personal style up a notch and have some fun with fashion, year-round.